Although students can be successful at a wide range of institutions, the college match is important. A good match is not defined purely by the selectivity of the institution, but by a complex set of factors that ultimately support a student’s success. The college match is especially important for lower-income, first-generation students, who often choose to attend colleges that are less selective than those to which they could gain admission. When students attend colleges that are a good fit – academically, financially and socially – they are more likely to graduate. We have carefully selected a set of geographically diverse colleges and universities with a commitment to helping high-potential students to succeed. All the data we used to select higher education institutions comes from the Integrated Postsecondary Education Data System (IPEDS) and is updated annually to reflect the most current complete year of data available. The TalentED Project is designed to facilitate the attainment of a bachelor’s degree, so is only available to colleges and universities that award this credential. The TalentED Project is also only available to nonprofit private institutions or public institutions that have more than 500 undergraduates. Admit up to 85% of applicants and graduate 60% or more of its students within six years (meet or exceed national average). Admissions rates are calculated using a 3-year rate. Institutions must demonstrate success getting students to and through college, thus colleges profiled in The TalentED Project must have at least a 40 percent six-year graduation rate. Enrollment in a selective college or university can positively affect student graduation rates, advanced degree attainment and lifetime earnings. To better guide advisors and students, we differentiate levels of selectivity into selective, highly selective, and most selective. Lower-income families often contribute a disproportionately high percentage of their income to higher education. At the same time, misconceptions about college costs can prevent students and their families from considering options that may be within their financial reach. The colleges we have highlighted are more likely to have a reasonable net price for lower-income students. 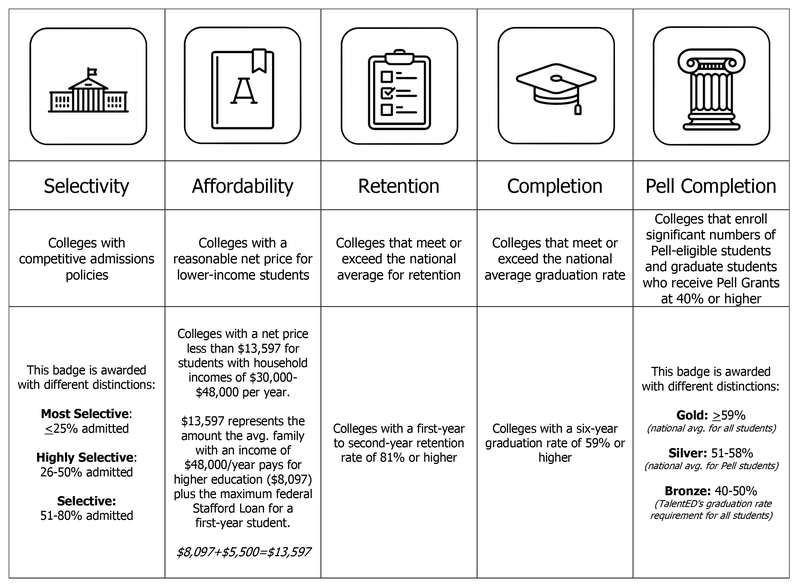 While we use the affordability badge as an indicator, we understand that affordability is different for every family and that an individual student’s financial aid package may not match the data presented on this site. Participating colleges also have the opportunity to highlight financial aid policies and programs that serve lower-income, first-generation students in their enhanced profile. Many lower-income, first-generation-to-college students face multiple challenges persisting in college. We award a retention badge to institutions that meet or exceed the national average for retention. The ultimate goal of finding a best-fit school is to give students the best chance for graduating with a college degree. We award a completion badge to institutions that meet or exceed the national average six-year graduation rate to ensure students are matched with institutions from which they are likely to graduate.